Hudson’s 4th birthday has snuck up on me this year. I usually have a few ideas for what theme or gifts he might like bouncing around in my head way before Christmas, but there really wasnt any more room for more thoughts this past December! I realized his birthday was a month away and I had no theme, no gift idea, no date, no location…..luckily Im pretty seasoned at this, instead of freaking out I just got started. I thought that since I was at the very beginning of my party design process that I’d document it and share. 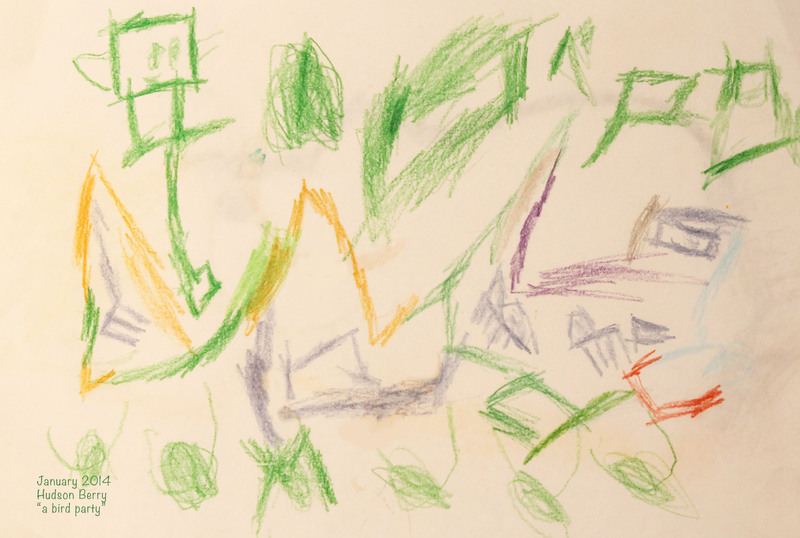 Clearly there is a bird, he tells me that the orange parts are a house (duh) and I got excited when I thought he drew blue party chairs, (CHAIRS!! Im a chair fanatic if you didnt already know) but those are “short caterpillars” and at the bottom are green checks. So you see, he pays attention to my methods and habits, I make a lot of lists! 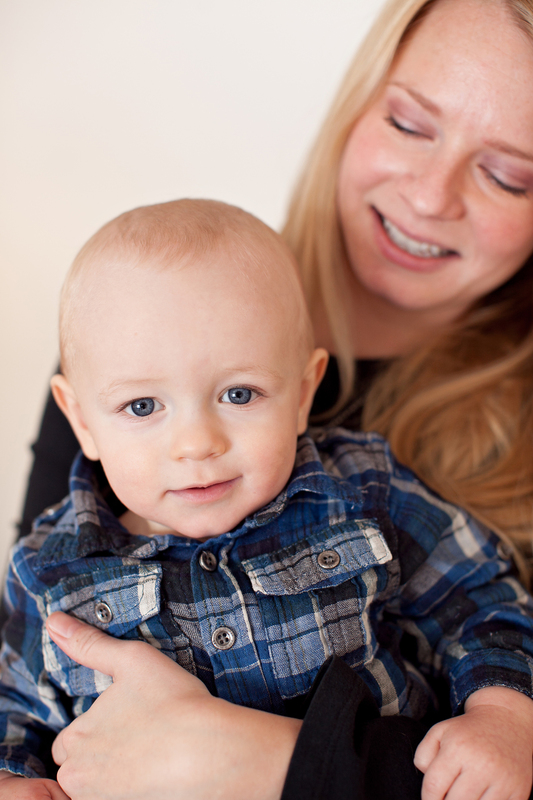 Hudson is a cool little kid that doesnt take that long to make a choice and he STICKS with it. I refrained from saying “Sorry Baby, a bird party is not on my grand party list of themes that Ive fantasized about since having you” but I did show him some parties on Spaceship and Laser Beams, a party site that specializes in only boy party themes and printables. I asked him what he thought about some specific themes, hoping that he would like something from my grand party list. There was one image of a monster party that he got excited about and that was that. He liked it, I liked it and its on my list! Hudson is having a Monster Bash party this year and since that night it is all he talks about. There are plenty of party check lists out there for timelines of when to do what to get it all done. I dont really work like that. I do have an order in which the process has to happen and I have a rule about sending invites 2 weeks before. But thats about it. I think the least amount of start to finish time I ever accomplished a project was a dessert table for Macy’s 5th grade Luau in 2 weeks and it rocked! I can easily think of many parties that I started on 2 months or more in advance. I do know one thing, the longer I have to plan and design a party the more it ends up costing, so short on time really means less time to shop and thats not a bad thing! First things first, I always start with an inspiration that comes from something personal about the guest of honor. Last year was easy, Hudson was obsessed with superheros. This year he doesnt have a current favorite toy but we always have a few favorite books. The Monster That Lost His Mean by Tiffany Strelitz is a great book that we all love. Besides the message I adore the colors and illustrations by Kristie Edmunds. So I wanted that book to be the spring board for our party. I pin and pull images into a desktop file like everyone else and if I have the time I like to make mood boards. Even my husband doesnt really understand my vision sometimes unless I do a mood board. 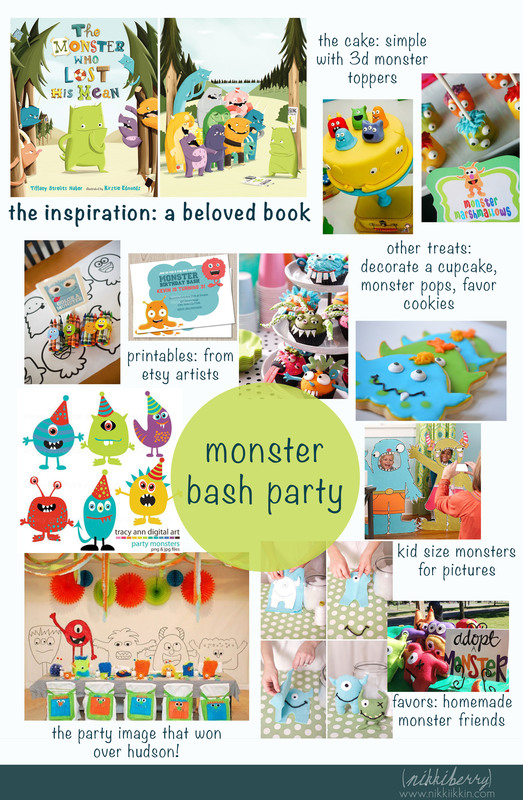 So here is my mood board and Im super happy that there are a ton of inspiring Monster Bash parties out there and even the perfect printable set on etsy to be the imagery for Hudson’s party. This post is already lengthy enough so I wont describe each item but I am working in a different way with this party. We will be having it at a local cafe and I will not be allowed to bring in my own cake and cupcakes!!! OH NO what will I do?? Dont worry, it will be fine. Im pretty sure simple fondant toppers on the cafe’s cake and cupcakes will satisfy our guests and my discerning eye. Plus Im looking forward to all of the benefits of a party thats not at home…like not having to clean up my apartment!! In addition to the mood board I have a list that I refer to when Im forming the initial design of a party. I think about all the party supplies I will need to find or make. Which ones will work or not work for my party, which ones I think should be spectacular or just supportive in the theme. Knowing what products are readily available is a good way to make a budget and keep myself on track for my favorite part, the hunt and gather! 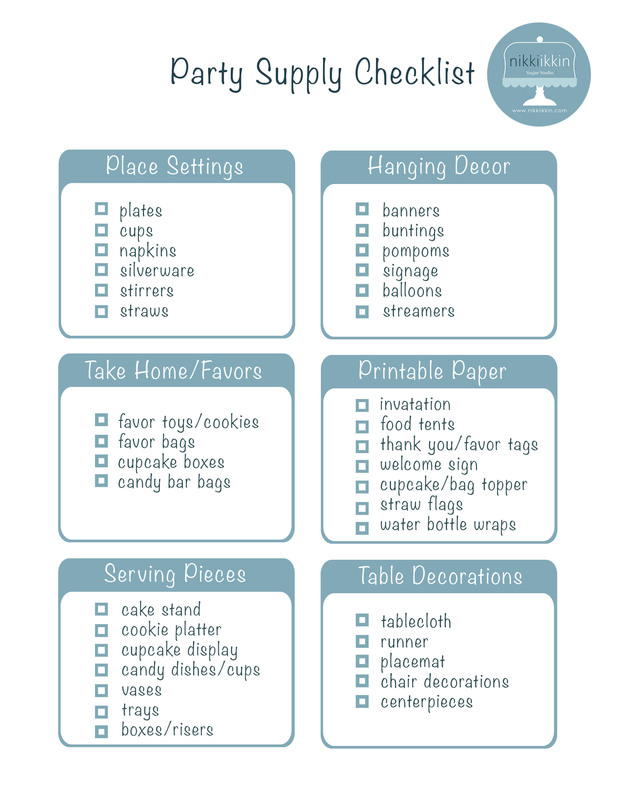 Ive made a cute little check off sheet to share and included my favorite party supply resources below. Whether you are in NYC or not you can check out any of them online, most of the time their speciality items are worth the shipping. Happy party planning, more details to come! I cannot wait to see this!!!! Its gonna be cute and you know we get to do it at Treats Truck so im extra excited! Darn social media! It took me a while to look back and find WHERE you spoke me…..FB, IG,Twitter, email, oh right, I have a blog too! Of course I’d love to fix up some sweets for you! Whenever you want to start just send me an email!